I’ve got this sticker on my computer. And just like these two little imps stir up the dust in THE CAT IN THE HAT, I put it there to help shift my perspective at times. It’s there to remind me not to take myself too seriously; to remember to resurrect the joy that’s buried within the task at hand. It reminds me to take it in stride when I get stressed over a stubborn plot point (or the fact that I’m failing miserably at coming anywhere close to my nano goal). 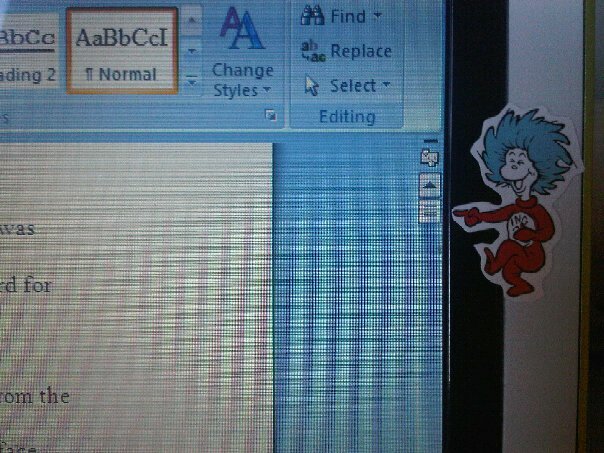 Also, Thing 2 is a great ego-booster when I do write something funny! Well, something that he and I find funny, anyway. Life can get overwhelming at times. And for when it does, it’s good to have a few little pick-me-uppers scattered around in strategic places. Like the well-known phrase goes: If I don’t laugh, I’ll (insert undesireable outcome of your choice). Sometimes laughter is just quite simply the best alternative. Two Posts in One Day, Oh My! You see, Dr. Seuss is my most beloved author hero. I’ve always adored his books; their silliness, the way they make me laugh (and stare), the way rules are broken to make up brand new words no one’s ever used before, and the way the illustrations magically transform those fantastic words into real, living, breathing, creatures. Dr. Seuss was the one who sparked my love of letters and words. When I was young, I read his books over and over again, committing them to memory and even tape recording myself reading them. (Yes, tape recording myself – that was the extent of technology back then! What can I say?) A few years ago, I accidentally threw out my only live recording of reading Mr. Brown can Moo… Can You? and One Fish, Two Fish, Red Fish, Blue Fish. When I realized what I’d done, I cried. It still makes me so sad to think about it. So, here’s to you, Dr. Seuss, on your birthday. Your forever fan, Claudia.